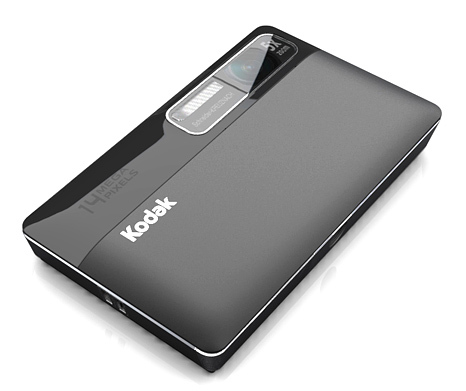 With the KODAK SLICE Touchscreen Camera, you can carry your pictures everywhere—without taking up space on your memory card. 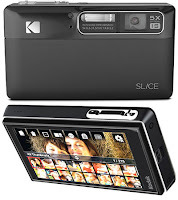 The SLICE features a built-in photo album that lets you view and organize a portable version of your entire photo collection via the vibrant touchscreen display. And when you press Kodak’s Share button, you can tag pictures for upload directly to KODAK Gallery, YouTube, FACEBOOK, and FLICKR sites, as well as e-mail. You’ve always kept your pictures close to heart. Now you can have them all right at your fingertips. The real KODAK Moment happens when you share. - Hardware: PENTIUM-4 1.4 GHz processor or higher, PENTIUM-4 2.86 GHz processor or higher for HD video, 1 GB RAM and 64 MB video RAM, 300 MB hard drive disk space available, CD-ROM drive, USB v1.1 or higher, 1024 × 768 display resolution. 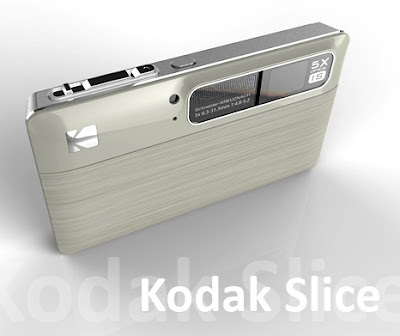 The KODAK SLICE Touchscreen Camera is more than its name suggests. It’s a high quality, ultra compact camera, but it’s also a pocket-able digital photo album that can hold up to 5000 pictures with some clever search technology so you can ‘slice’ through your entire pictures collection to effortlessly find the pictures you want. When a picture is taken with KODAK SLICE, two copies of each picture are saved, a high resolution picture is written to the MicroSD/MicroSDHC memory card (sold separately), and a second picture is automatically resized to HD resolution and stored in the 2 GB of internal memory dedicated to the SLICE Album. When you transfer pictures to your computer, the SLICE Album copies stay on your camera so your photo collection is always ready to share wherever you go.The professional quality 5X SCHNEIDER-KREUZNACH VARIOGON prism lens design allows you to get close with an ultra-thin pocket-able camera, and also adds extra-protection since all lens movement occurs safely inside the case. 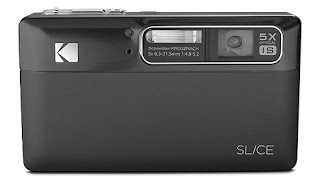 SLICE features optical image stabilization which reduces blur caused by subject movement or fast-action situations and automatically minimizes the effects of camera shake to deliver clearer, sharper pictures. SLICE search feature - Face Recognition makes finding pictures easy. It’s challenging to find a favorite picture even among the hundreds on a memory card, but the SLICE Search feature is so powerful, it makes easy work of searching the 5000 pictures that you can carry in your pocket-able SLICE album. KODAK SLICE uses face recognition technology to identify the people in your pictures so it’s easy to find the photos you want. Up to five faces can be detected in a single image when a picture is taken. Simply label detected faces with their name using the on-camera keyboard. The next time a picture of that person is taken; the camera will automatically recognize the face and apply the appropriate name to it. Up to 20 different faces can be entered in the on-camera face registry, with up to five different poses of each person used to increase the accuracy of the facial recognition. Once a picture is tagged via face recognition you can search your entire SLICE Album for all pictures of that person. In addition to searching “people” found by face recognition, you can also search by “keyword”, “location” or “date”. To add a keyword or location tag, tap the Tag icon, select “keyword” or location” and use the on-camera keyboard to add a tag. You’re out snapping pictures with friends and want to share them online as soon as you get home. 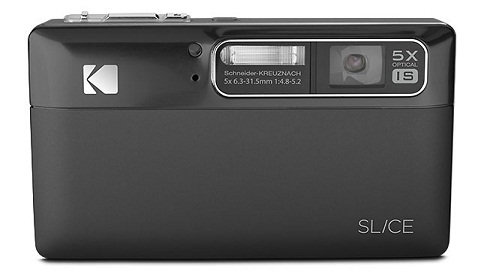 That’s a snap with KODAK’s one-button upload. 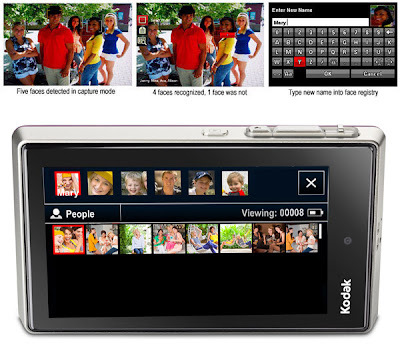 In review mode, just press the Share icon to select your sharing destinations - YouTube, FACEBOOK, FLICKR, and KODAK Gallery sites; e-mail, and KODAK PULSE Digital Frame, too. When you connect your camera to your computer with the USB cable provided; your pictures and videos will automatically be transferred to your computer and uploaded to all tagged destinations. It’s that easy. 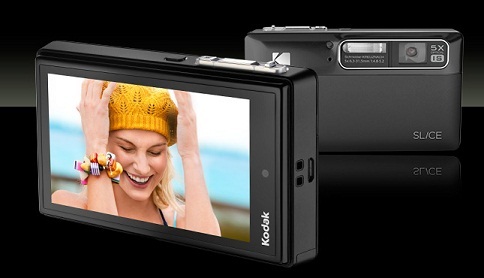 Kodak's Smart Capture feature allows you to become a better photographer in just about any environment by applying three automatic split-second processes: Intelligent scene detection - detects and analyzes the type of scene; Intelligent capture control — automatically sets camera settings including exposure, focus and ISO for clear, sharp pictures even in low light and challenging situations; and Intelligent image processing - reduces noise and clears up dark shadows for vibrant, crisp details and true-to-life colors. The 14 MP KODAK SLICE can capture pictures that can make stunning prints up to 30 × 40 in. Don’t want prints that large? Then you have plenty of room to crop and enlarge and still have photo quality smaller format prints. You’ll also have plenty of resolution for viewing your pictures in high definition on an HDTV or other HD devices. Select 16:9 format on KODAK SLICE and your pictures will perfectly fill an HDTV screen without cropping or stretching. HD Video - Capture video at HD (1280 x 720 @30 fps) or WVGA (848 x 480 @ 30 fps) in QUICKTIME H.264. with audio during recording and playback, and on-camera editing that allows you to trim the ends and even save a single frame. HD single frames are the perfect size to email and even make small prints. W × H × D: 4.0 × 2.3 × 0.7 in.